Swindon number one Troy Batchelor has admitted his return to form is overdue. Robins promoter Gary Patchett had voiced his concerns about the 24-year-old Australian, after he recorded a lowly 5.69 average in their first six meetings in the Elite League. But after securing 14 points in the 53-36 win over Lakeside on Monday, Batchelor told BBC Wiltshire: "I guess those points are overdue. "It's about turning a corner and carrying on from here." The former Peterborough rider continued: "It's pretty frustrating when you're sitting there being taken out of rides and being beaten by people you shouldn't. "I haven't won the World Championship in one day but it's good to win a few races again." 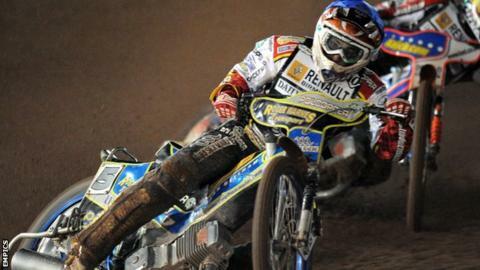 The win over the Hammers moved Swindon up to second in the league standings, four points behind leaders Poole. "It was an awesome win," added Batchelor. "Lakeside are a strong team and it shows we are a good team. "It's a long season but it's going to be good and everyone seems to be enjoying themselves."